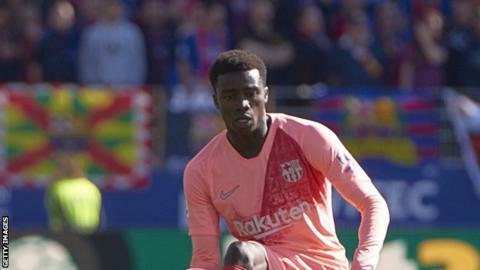 Senegal international Moussa Wague described his official La Liga debut with Barcelona as "a dream come true" after playing in their goalless draw at Huesca on Saturday. The 20-year-old right-back took part in the entire match and was booked as Barcelona rested six first-team regulars - including Lionel Messi - ahead of Tuesday's Champions League game against Manchester United. Wague, one of four debutants on Saturday, is the first Senegalese man and 14th African to play for Barcelona. "It's a dream come true, I'm really happy to play for the best team in the world," Wague told Barcelona TV. On his Facebook page, he said it was "a day I will never forget." "Happy to make my La Liga debut, it wasn't the result we wanted but we're still on the top of the table. Now let's focus on our Champions League game against Manchester United." Barcelona remain top of La Liga, nine points ahead of second placed Atletico Madrid and 14 points ahead of Real Madrid who have a game in hand. Wague had been included twice before in the Barcelona squad in the Copa del Rey and Catalan Super Cup. He was an unused substitute in their 2-1 loss to Levante in the first leg of their Copa del Rey last 16 tie in January, but played the entire Super Cup match against Girona in a 1-0 defeat last month. The Senegal international had been with the Barcelona B team in the third tier league since joining the Catalan club from Belgian club KAS Eupen last August. He had to wait until November to make his Barcelona B team debut due to a delay in paperwork, but has since been playing regularly - scoring two goals and providing three assists so far. Wague played in all of Senegal's three matches at the 2018 World Cup in Russia and scored his first international goal in a 2-2 draw with Japan to make him Africa's youngest-ever goal scorer at the tournament.